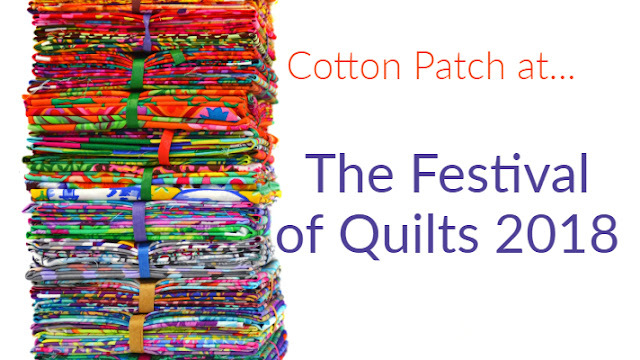 A rotary cutter is a patchwork and quilters' number one tool. It is the most efficient way to cut out accurate shapes with clean, straight lines and well defined corners. When we asked our ladies and gents at Cotton Patch what their favourite tool was, the humble rotary cutter won the vote hands down. Being a tool that is so regularly used, it is important that you chose the right cutter for you, and with so many options on the market now you are spoilt for choice! 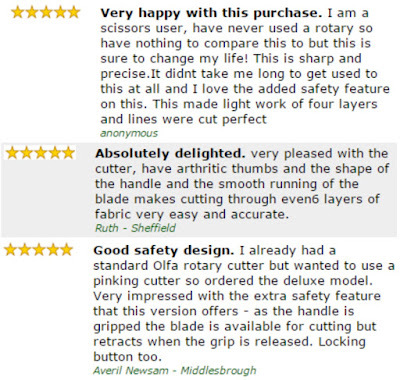 Reputable brands such as Olfa (the original inventors of the rotary cutter), Clover, Fiskars, True Cut and Omnigrid all make high quality cutters. The standard sizing for blades is 18mm, 28mm, 45mm and 60mm. The small 18mm and 28mm blades are great for intricate shapes and curves, particularly useful if you're dressmaking. The larger ones are more popular for general use. At home I tend to reach for my 45mm blade, however when doing a lot of straight line cutting at the shop or several layers of fabric at a time, the 60mm is my favourite. 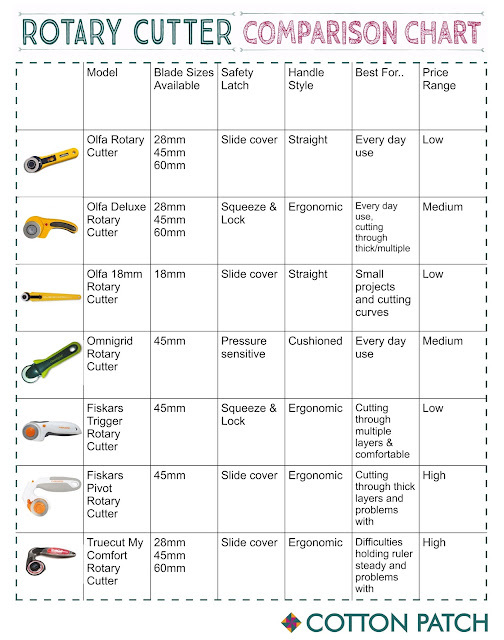 I would suggest that unless you are doing significantly more intricate cutting or high volume cutting, the 45mm blade is a great all rounder for your first blade. You can see our rotary cutter spare blades here. I will put it straight out there - if the cutter doesn’t have a safety latch, don’t buy it. It’s not worth risking your fingers (and toes) for. It’s important that the latch is accessible and easy to use, and if you have difficulties with your joints (arthritis for example), you may want to look for a sliding latch rather than a button, as they require less pressure. 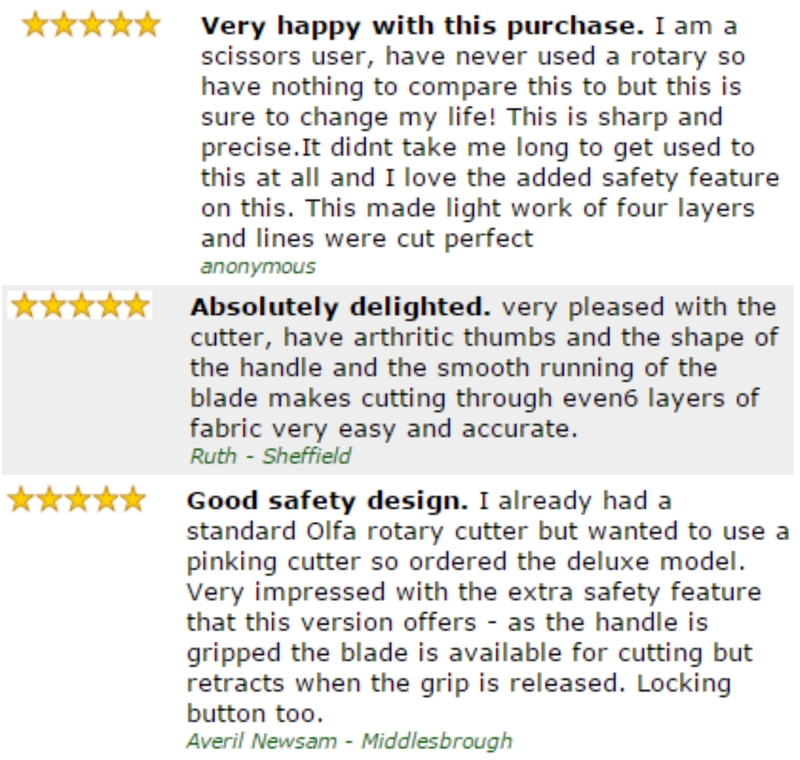 Most cutters have a button or switch which sits right under your thumb, so you can lock and unlock the blade with ease. Handles can be straight, curved, ergonomic, padded and everything in between. Comfort is important, and if you have troubles with your hands or wrists, there are a wide variety of ergonomic handles available that reduce pressure. This is the granddaddy of all rotary cutters, the one that started it all. So it seems right to begin here. This is the model we use at the shop for cutting all your beautiful fabric orders off the bolt. It is also the one I reach for at home as well. This is the smallest blade on offer, and perfect for those really intricate projects or if you are using fine materials for dressmaking. 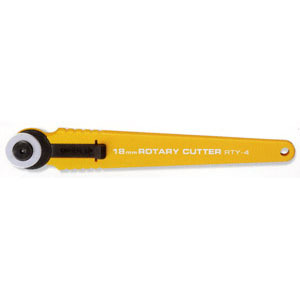 If you already own a rotary cutter, this can be a very useful addition to the family. 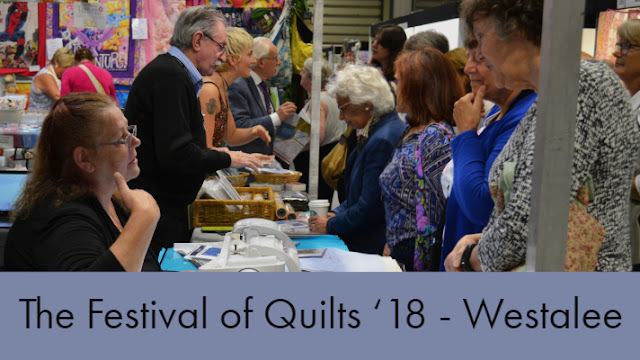 It is not suitable as a replacement for a larger cutter however if you intend but be regularly cutting out patchwork shapes. 18mm standard rotary cutter from Olfa for intricate designs such as miniatures. 18mm stainless steel blade. This model has a straight, rubber grip handle and pressure sensitive cover which moves away when you press down to cut, eliminating the need to lock and unlock your safety latch. 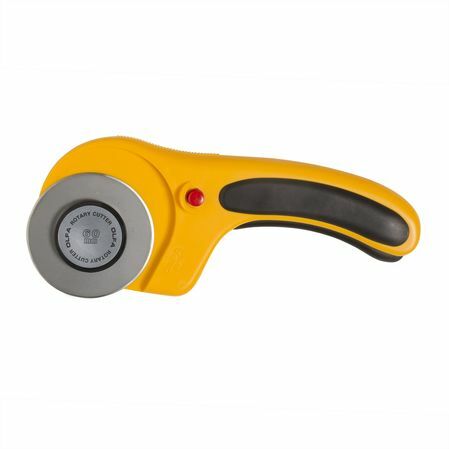 45mm cutter with lockable, pressure sensitive, safety guard that slides back when pressure is applied and slides back again when the cutter is lifted from the surface. The Fiskars Trigger Rotary Cutter has a 45mm cutting blade with a high quality steel blade. It cuts smoothly, precisely and easily through multi-layers. You get ultra-close to the ruler avoiding fabrics from slipping and the long ergonomic handle fits all hand sizes for a comfortable grip. 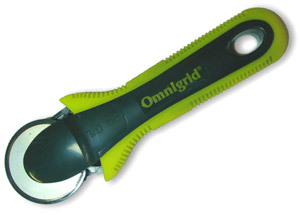 Simple and safe to use with a blade retracts when you let go the trigger. There is a safety locking system with an orange button to lock and unlock the trigger. The blade can be easily positioned either side, for right or left-handed. 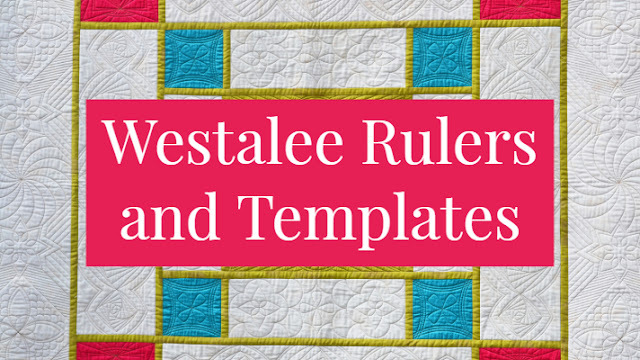 This one has all the bells and whistles. The pivoting handle allows you to choose between standard, power and comfort position depending on what you’re using the cutter for. 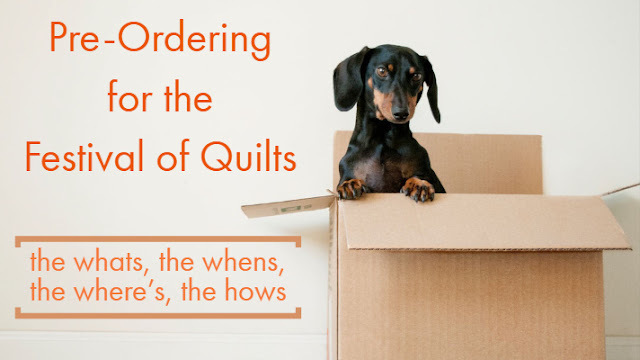 Because of the slightly angled position if the blade, less pressure is required to cut through the fabric making it a great option for those who struggle with their hands and wrists. 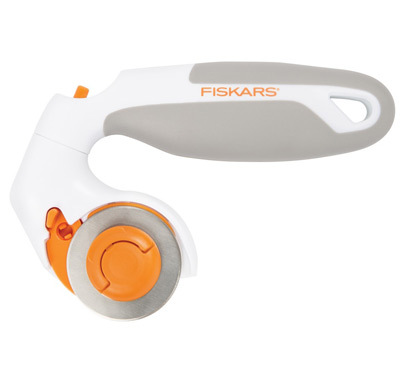 The Fiskars Pivoting Rotary Cutter offers a unique pivoting soft handle that rotates to 4 different fixed positions to increase comfort when cutting for long periods of time. The classic position offers familiar feel, the power position enables you to cut thick material more easily and the ergonomic position (45° to the left or to the right) relieves wrist pressure. The enhanced blade position requires less force during cutting and makes it easier to cut through layer of materials. 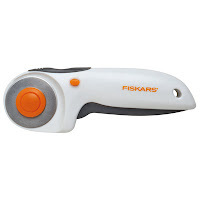 Similar to the Fiskars, this models blade is slightly angled, meaning less pressure is required to cut. You can also combine it with a TrueCut ruler which guides the blade so you don’t have to worry about rolling off track. This would be perfect for someone who struggles to hold the ruler still whilst cutting. To top it all off, you can customise the handle! What more could you possible ask for from a rotary cutter.. The TrueCut My Comfort Cutter ergonomic rotary cutter has a unique handle design that aligns your wrist naturally, placing all cutting power directly over the blade and eliminating stress in the wrist and arm. The My Comfort Cutter uses the TrueCut track and guide system, which works with all TrueCut rulers to keep all of your cuts straight every time. This guide is also removable so the cutter can be used normally with any ruler without the benefit of the track and guide system. With the My Comfort Cutter, you can customize your rotary cutter's handle with your own designs, photos or fabric! Colour of Truecut cutter my vary, grey or blue. Also available as a 28mm cutter and a 60mm cutter. 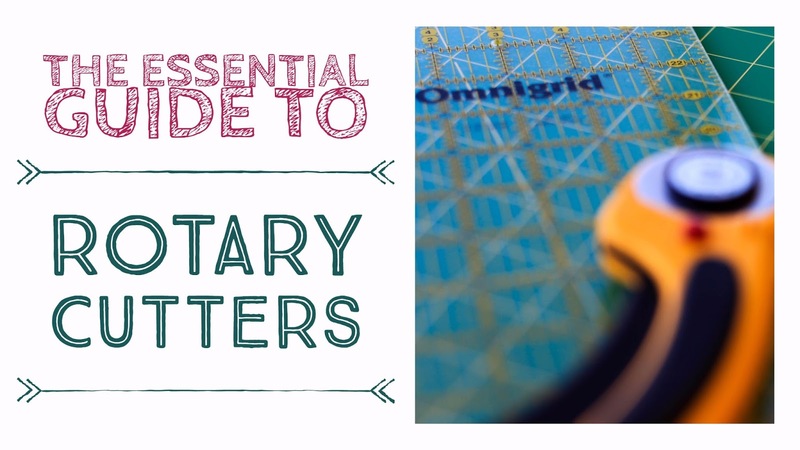 For loads more information on all the cutters we have available, plus mats, rulers and other accessories, have a read of our e-book, it's bursting with useful information and videos. You can find the mats, cutters & rulers e-book here. If you have any more questions, gives us a call or drop us an email. One of our super knowledgeable members off staff will happily help you out. If you use both left and right hand all the time like me, the most simple Olfa (any size) is the easiest. You don't have to switch the bladeside by removing etc. it. You just hold it in your hand either left or right, the way you are supposed to do. No unscrewing, just changing hands and holding it the right way for the hand using it.